The Kapatid Network reigned supreme in the highly-coveted primetime block (6pm to 10pm) last Sunday (September 18) with 8.5% AMR (28.8% audience share) as compared to ABS-CBN’s 8.3% AMR (28.1% audience share) and GMA’s 7.8% AMR (26.5% audience share), data from Nielsen Media Research in Mega Manila showed. Boosted by the formidable program lineup of Comedy King Dolphy’s Pidol’s Wonderland (5:30pm), Aga Muhlach’s Pinoy Explorer (6:30pm), Bossing Vic Sotto’s Who Wants to Be a Millionaire? (7:30pm) and Ryan Agoncillo’s Talentadong Pinoy (8:30pm), TV5’s Sunday primetime block continues to raise the bar in offering shows that highlight moral values, education and Pinoy pride. Pinoy Explorer pilot episode posted an impressive 8.3% AMR or a total of 1,975,813 absolute viewers – 84,295 more than ABS-CBN’s TV Patrol Weekend’s 1,891,518 (7.9% AMR); and 465,543 viewers more than GMA’s 24 Oras Weekend’s 1,510,270 (6.3% AMR). Meanwhile, Who Wants to Be a Millionaire? was the most-watched program across the day (2am to 2am) with 11.1% AMR (33.6% audience share). 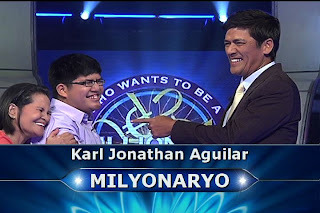 The September 18 episode of the world’s most famous game show made history after 28-year-old Karl Jonathan Aguilar won P2 million, the first non-celebrity to win the jackpot. 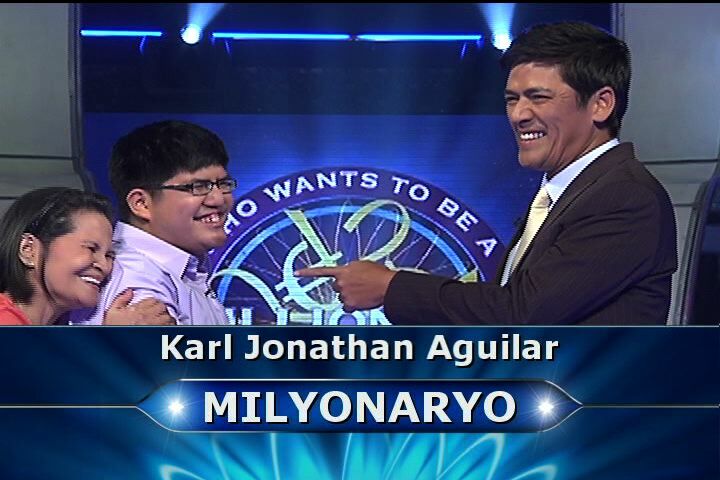 Often teased since his childhood because of his cleft palate, Karl buried himself in studying and reading books while growing up. This absorption of knowledge paid off as he played his game with pure smoothness, delighting host Bossing Vic Sotto to no end. TV5’s telecast of the much-awaited Star Power: Mayweather vs. Ortiz boxing bout was also the most-watched daytime offering last Sunday both in Mega Manila and Nationwide Urban Philippines. According to Nielsen’s NUTAM data, the Floyd Mayweather vs Victor Ortiz fight posted a 10.5% AMR, outpunching the 5% AMR of ABS-CBN’s ASAP Rocks and the 4.6% AMR of GMA’s Party Pilipinas.